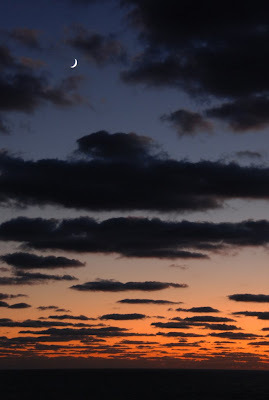 Astrophotography from the deck of a moving cruise ship leaves very few options. 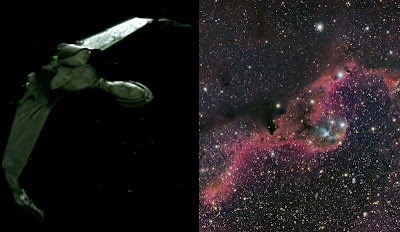 Since the ship is constantly pitching, one must use a fast shutter speed to eliminate blurring. Of course, that pretty much limits you to the sun and moon. But what's not to love? 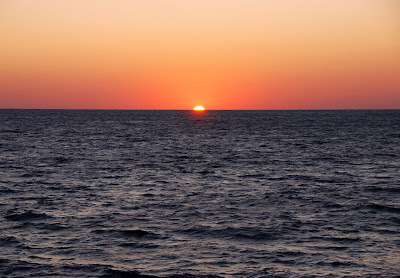 The sun and moon are awesome, particularly out at sea. Just a couple of shots while cruising through the Atlantic a week ago. 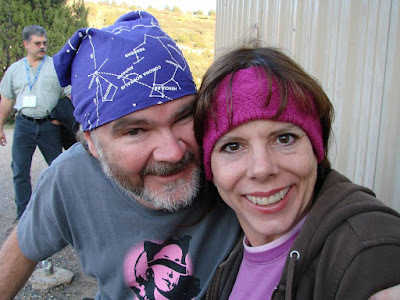 Kim and I cruised from Montreal down the St. Lawrence river, then down the East coast to Miami. 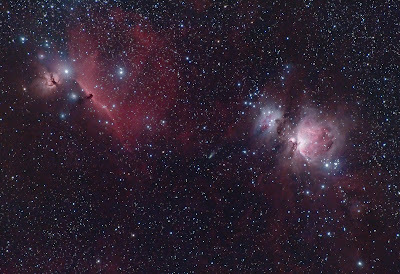 This is an image of the Horse Head/Flame and M42 in Orion (the Hunter). And if you look closely you will see a "wanderer" passing right between them -- Comet 217P/Linear. Although not a big and bright comet, it does sport a small tail and is particularly beautiful for the path it has chosen! I noticed the comet was well placed last Monday morning, so I decided to have an adventure and make the drive to the Atoka dark site to shoot this composition. I took a nap, got up and left about 1:00am, started shooting by 3:30am, finished and headed home about 6:30am as the sun was coming up. 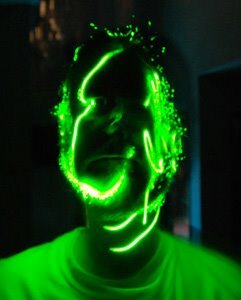 Okay, maybe a little crazy but I think the photo was worth it. Be sure to click on the image for a closer view! 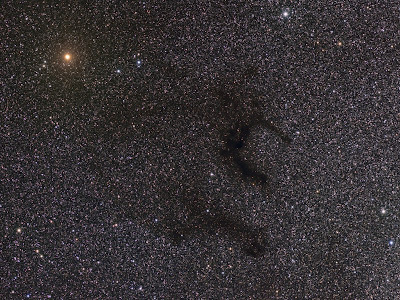 The little "S" shaped dark nebula is Barnard 72, otherwise known as the Snake Nebula. It is located towards the heart of our galaxy. As such, there are TONS of stars in this field! 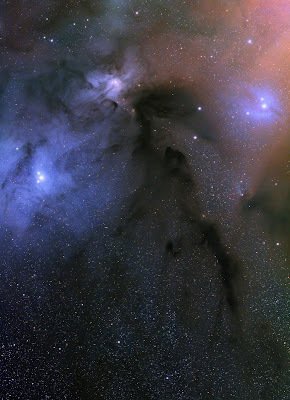 These Dark Nebulae are very dense areas of dust and gas that are silhouetted by the dense star fields. 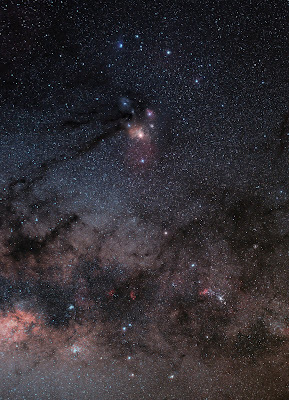 The Milky Way is filled with these objects. The skies at 3RF were very dark indeed, and the desert-like climate is very dry. I certainly plan on going back! 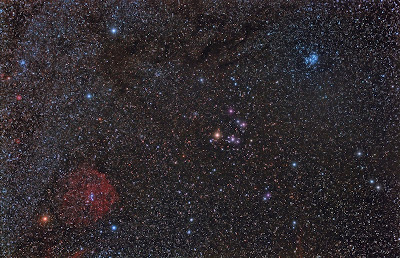 This colorful "Cocoon Nebula" is spun from dust and gas in the Constellation Cygnus. 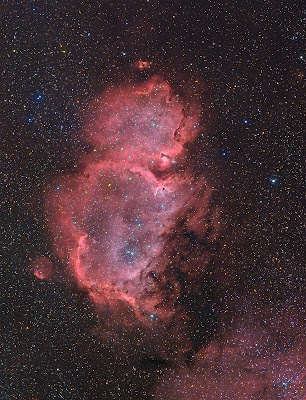 The pink/red/blue cloud is a star forming region, while a huge dark nebula can be seen stretching away from it. 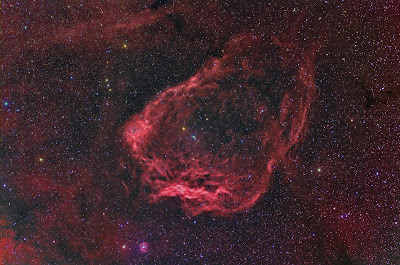 Since this object resides along the Milky Way, the field is populated by BUNCHES of stars! 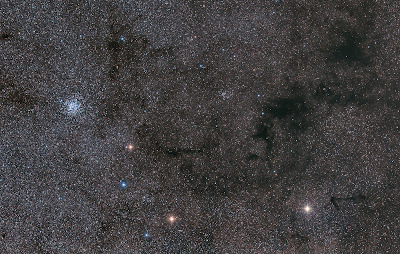 And here is another dark and dusty object, Barnard 142 & 143, otherwise known as Barnard's "E". 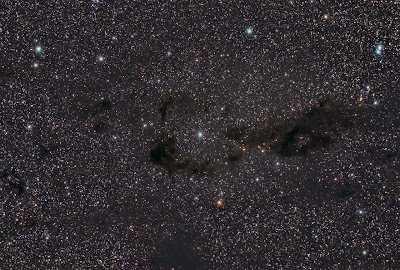 This interesting dark nebula resides in the constellation Aquila. But who is this cat "Barnard" you ask? And why is he making a list of these things? 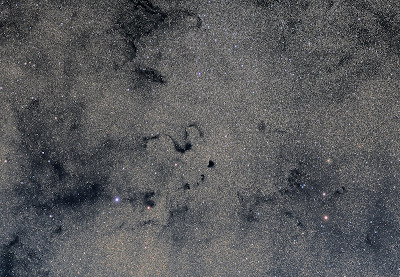 A very cool dark nebula in Sagittarius! 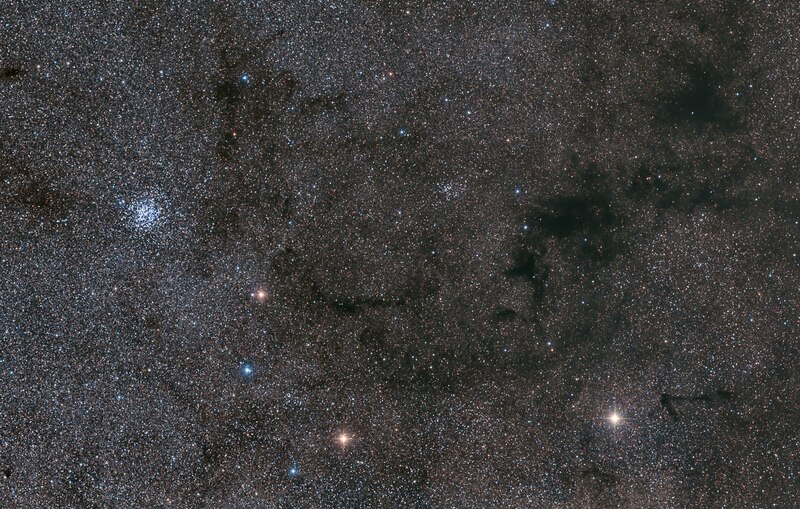 This is a dense star field, being near the hub of our Milky Way galaxy. 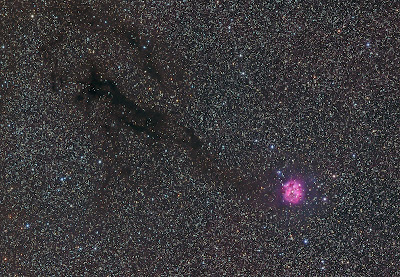 The yellow Globular Cluster to the left is NGC 6440 and there is a small planetary nebula in the upper left (tiny pink "box") called NGC 6445. 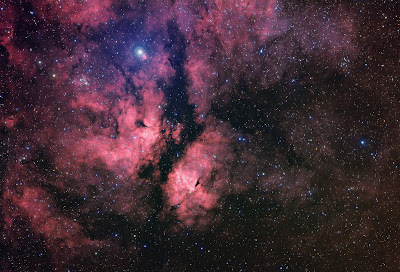 But the "star" of this show is the claw-like Barnard 84. 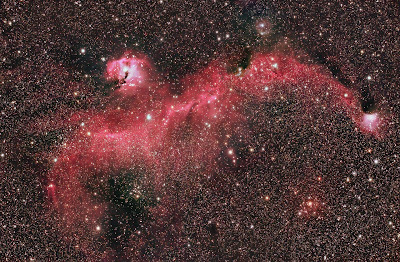 I love how it appears to be reaching towards us from deep space -- yipes! I imaged this last week from the ranch. 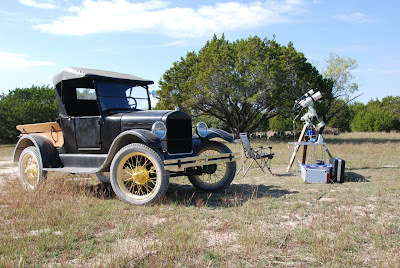 The weather was beautiful last week in the Hill Country. I was shooting this target one night until about 5a.m. 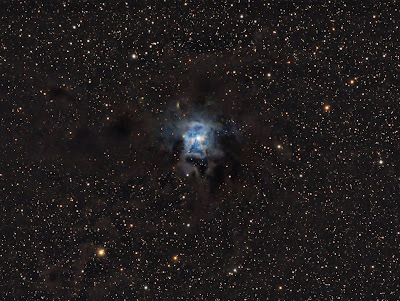 Here is this years attempt at the Iris nebula. I imaged this last year but was not too happy with it. I love this object and wanted to do better. I think I did (you can find my earlier attempt looking back at last July). 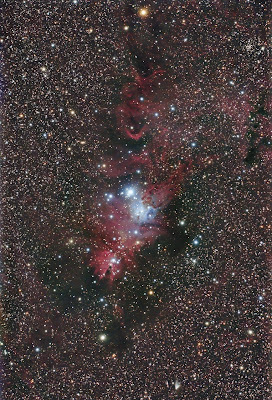 Although I am excited to see myself improving, I was humbled by another Astrophotographer who took my data and created an even better image in about an hour (it took me MANY hours to process mine). Ah, well... that's actually exciting, too. It just means I still have a long way to go to get where I want to be. And as they say, it really is about the "journey"! 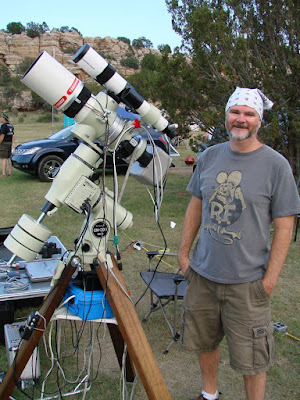 This image was taken at the Texas Star Party. 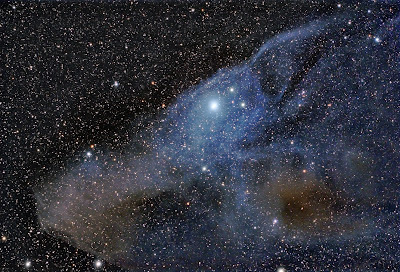 Here is an image of a wonderful reflection nebula in Scorpius. 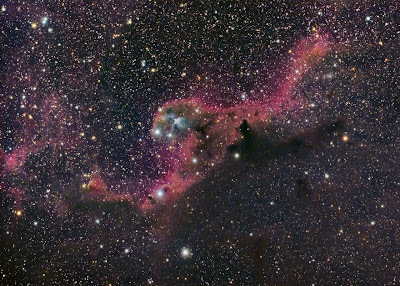 It is called IC 4592, but I like to think of it as a horse. 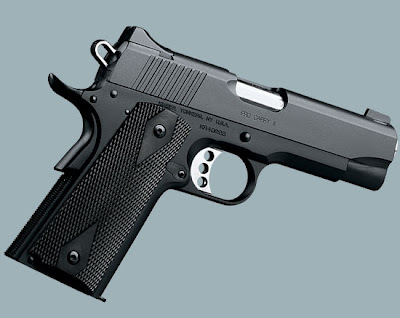 I really love this object. It is faint, but very large. In fact, I'm just catching a piece of it. 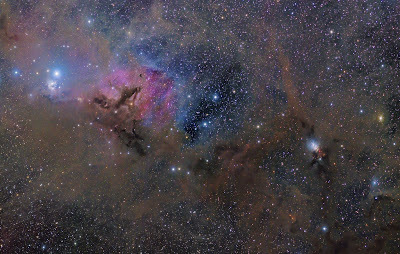 The clouds of dust are being illuminated by the star that makes up the horse's "eye". 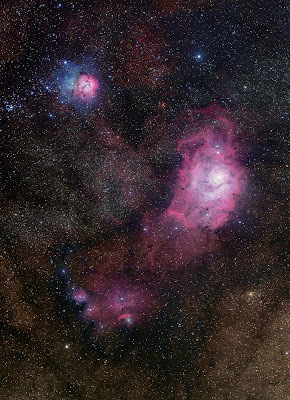 Reflection nebulae typically have a blue color because as light scatters through the dust it shifts to the blue end of the visual spectrum (the same reason our daytime sky is blue). 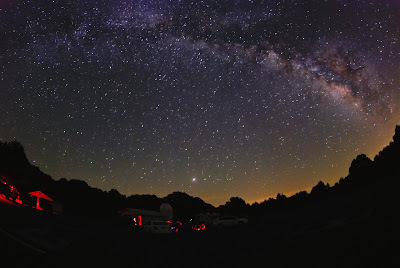 I took this image at the Texas Star Party (yes, I was busy at the TSP)! Here is The Needle Galaxy -- another image taken at the recent Texas Star Party. 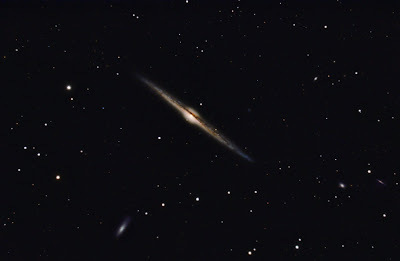 NGC 4565 (aka "the Needle") gets its nickname from the obvious needle-like appearance. 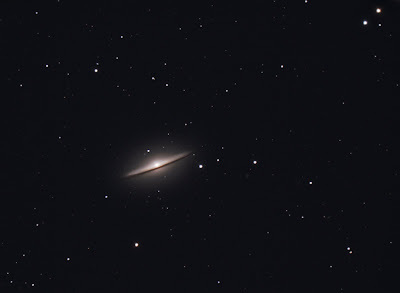 This galaxy is actually a disc shaped spiral (not unlike our Milky Way), but since we see it "edge-on" it does indeed resemble a needle. You can easily see the dark dust lane of the spiral arms silhouetted against the larger glowing central core. 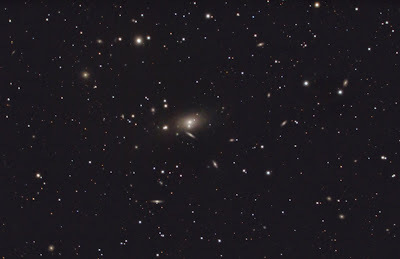 You can also see at least two other edge-on galaxies in this field. 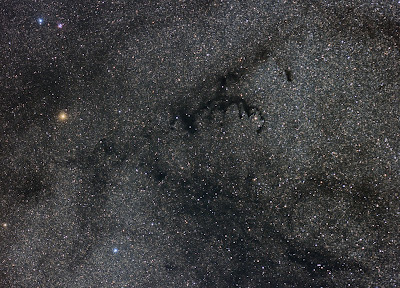 But for now, here is the first processed image from my trip -- the constellation of Scorpius, rising with the Milky Way. 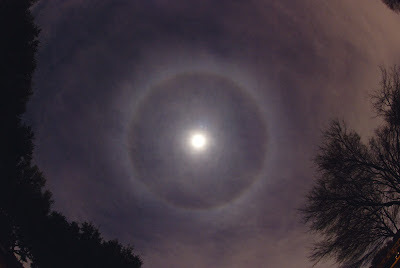 This awesome sight appeared each night about 3 a.m. and was definitely something worth staying up for! I imaged this target over 2 nights, collecting data with both a 28mm lens (for the entire constellation) and a 85mm lens (for the detail around the Rho area in the upper middle). 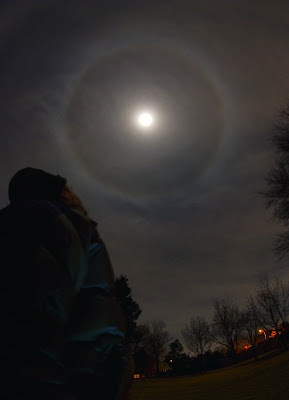 The image data was collected with my Modded Canon XSI, f/4, ISO 1600. 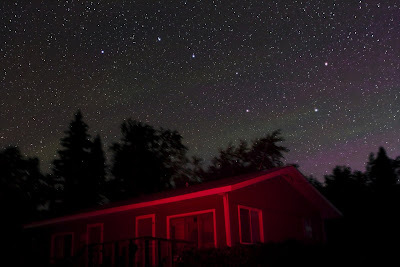 I used the AstroTrac for unguided tracking. Total exposure is a bit over 3 hours. Well, I've been putting together a new "grab and go" imaging rig that I can travel with and set-up quickly. I wanted something that could be carried in a small backpack and fit into airline overhead storage. 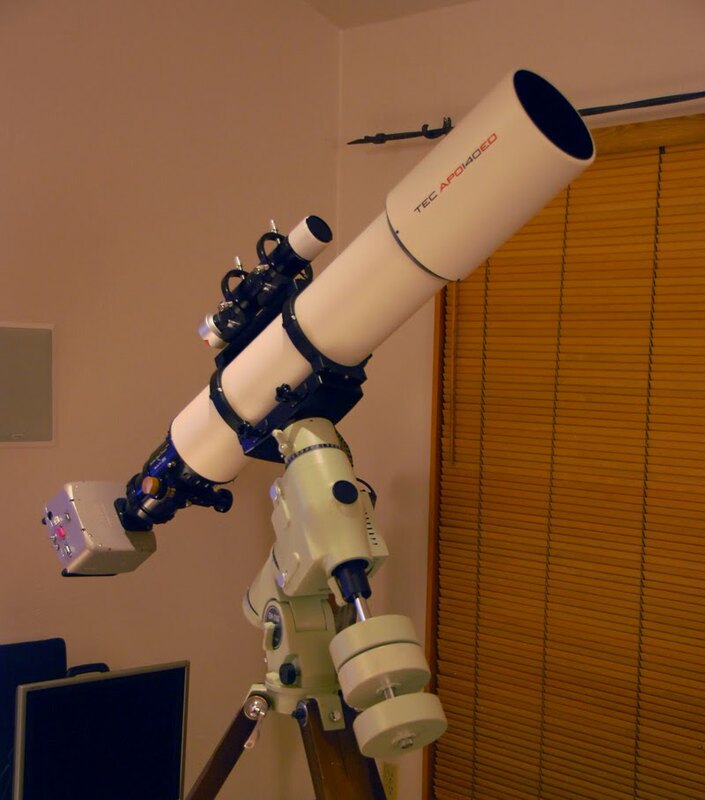 So I have chosen an AstroTrac and a Hutech Modded Canon XSI camera. I will post images and a full review of this new rig soon. But for now, here is an early test image of this new rig. 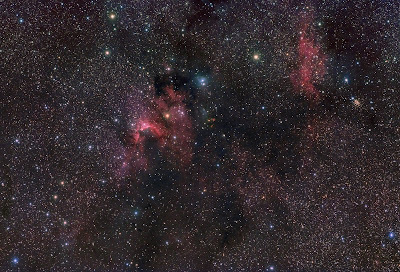 This is a very wide field that captures about half of the Auriga constellation. 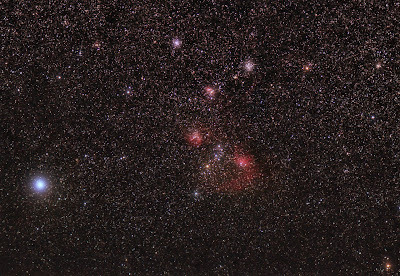 There are many objects here including -- M36 and M38 (the two star clusters towards the top of frame), IC 405 and IC 410 (the red nebulae in the center), and the bright star Elnath at the left. Be sure to click on the image for a LARGER view. 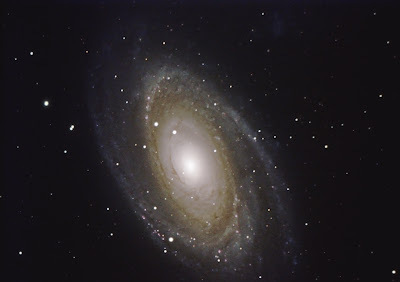 Why so many galaxies this time of year? 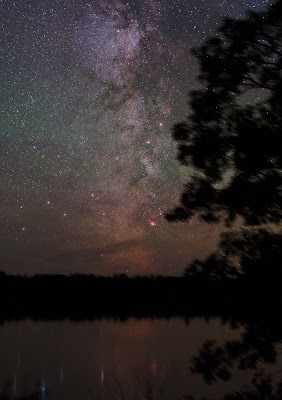 Well, it is partly because at night during this time of year, we are looking away from our Milky Way's galactic core and out into deep space. 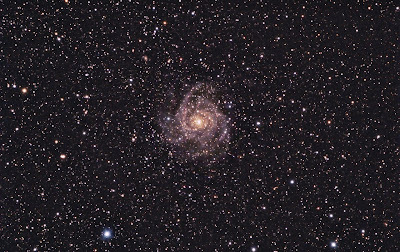 During the summer, our views are populated by the vast rivers of stars, dust, and nebulae from the spiral arms of our own galaxy. 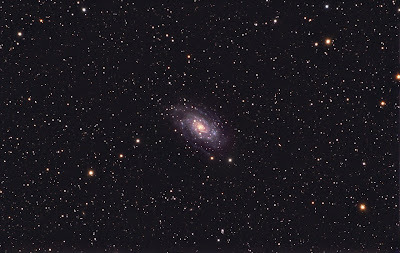 But looking away from our galaxy in the Spring reveals the great desert of space, populated by millions of other "tiny" galaxies that are unobstructed by our Milky Way. 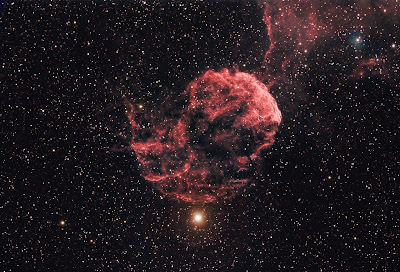 Every star and large nebulae we see are part of our own Milky Way. 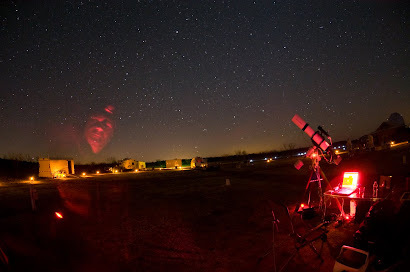 This is why there are not too many wide field targets in the Spring, since we are looking away from them. 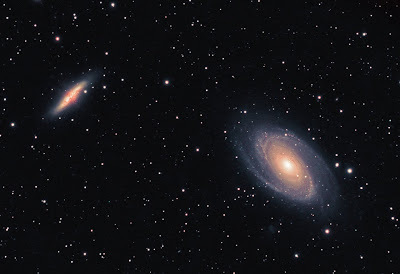 Anyway, here is a shot of M81 & M82. 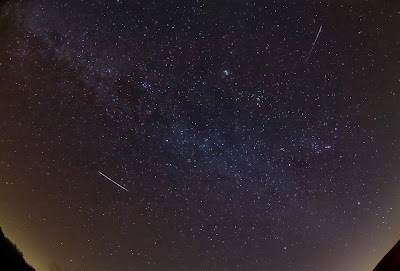 They are a lovely pair in the northern sky and one of the few wide field targets available at this time (framing them together). 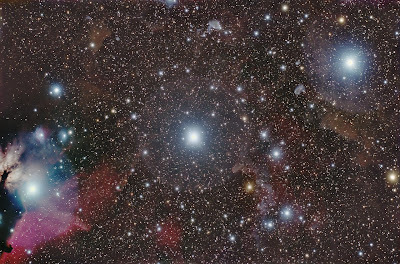 Looking at close-up shots of these HUGE celestial objects can be very abstract -- there is no easy way to relate to them. Okay, mentally picure the distance of 25 million lightyears. Did your brain explode? Well mine does. So I am interested in somehow showing the relationships between these massive objects so that I can start to develop a better sense of them. 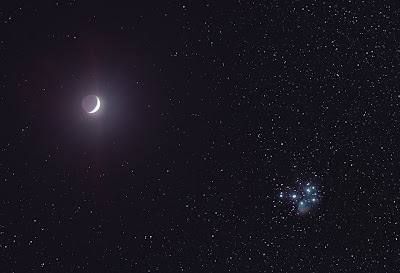 A few days ago, the Moon passed very close to the Pleiades. So I took the opportunity to try to image the two icons together. 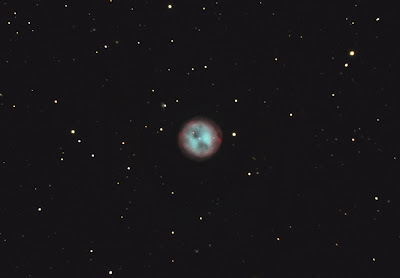 I used a new rig (an AstroTrac with a modified Canon 450D, Nikon 85mm lens, and mixed with some higher res data taken with my Takahashi FSQ scope). This was an interesting blend of gear and technique. As you can imagine, there is a HUGE dynamic range between the incredibly bright moon and the relatively dim Pleiades, so processing this image was tricky. At any rate, I hope you enjoy it. I'm pleased with the results and look forward to capturing other interesting "fly-bys".